Have I lost the land? Re: Have I lost the land? I did ask earlier but perhaps you would offer an opinion. If my predecessor had no knowledge of the actual legal boundary or was not in a position to verify the neighbours view does that validate or invalidate the decision to place the fence in its position? My point is there are more and more vulnerable adults living in isolation in their homes. If an unscrupulous neighbour eyes an opportunity and hoodwinks a homeowner to agree a fence position which is then not subsequently picked up in the event of death of the original party by the subsequent purchaser they will then accept the surviving party to the agreement that the boundary is correct. This can happen until someone decides to checks more thoroughly and realises there is a discrepancy between legal and physical. By this time 12 or more years have elapsed and AP is a possibility but its based entirely on an original subterfuge. How could this be challenged? In my cases I am convinced by anecdotal evidence that my predecessor was passively bullied by my neighbour and chose to sell up. He put up a new 6' fence against a small existing wire fence no more than 400 mm high to make the garden more attractive to a purchaser. He also built a small wall about 8' long by 6' high to stop plants and shrubs encroaching after the neighbour refused to cut back. All in all the neighbour has encroached progressively over years and appears to be rewarded. 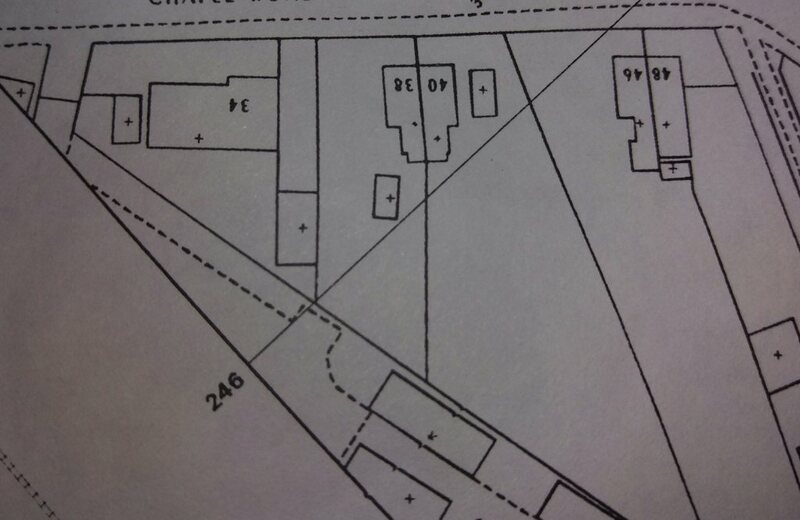 1	Where, as in this case, the property in question is registered land, the file plans show only general boundaries and not the exact line of the boundaries unless the property is said to be "more particularly described in the plan." 2	Similarly, Ordnance Survey plans, if not forming part of the registered title as filed plans, are no more than a general guide to a boundary feature, and they should not be scaled up to delineate an exact boundary. This is because the lines marking the boundaries become so thick on being scaled up as to render them useless for detailed definition. 3	In order to determine the exact line of a boundary, the starting point is the language of the conveyance aided, where the verbal description does not suffice, by the representation of the boundaries on any plan, or guided by the plan if that is intended to be definitive. 4	If that does not bring clarity, or the clarity necessary to define a boundary, recourse may then be had to extrinsic evidence - such as topographical features on the land that existed, or maybe supposed to have existed, when the dividing conveyance was executed. 6	Evidence of later features - that is, later than the earliest dividing conveyance - may or may not be of relevance. The probative significance of such evidence depends upon the extent to which, if at all, the dividing conveyance, or evidence of its terms, exists. 7	Where a boundary is in dispute, it is important to bring certainty to the determination by proclaiming the boundary and not leaving the plot "fuzzy at the edges" (Neilson v Poole (1969) 20 P&CR 909, Megarry J). 8	Even where a boundary line may be determined by reference to a conveyance, other evidence may be admitted and probative in establishing a different boundary obtained by adverse possession, This might apply in your caseshowing enclosure of the land in denial of the title of the true owner. As the phrase implies, title is established by intentionally taking exclusive possession of land without the consent of, and adverse to the interests of, the true owner, and maintaining such possession continuously for the limitation period. 9	As to informal boundary agreements, the statutory requirement that contracts for the sale or other disposition of land be in writing does not apply. That is because the purpose of such agreements is to demarcate an unclear boundary referred to in title documents and not to transfer an interest in land. 10 Such agreements are usually oral and the result of neighbours meeting to avoid or resolve a potential or actual dispute. However, there is scope for a boundary agreement to be implied or inferred - that is, to be the logical conclusion to be drawn from primary facts. 11	When bearing these principles in mind as the platform on which to place and examine the facts, a judge should have regard to three further important yardsticks or rules of thumb. These are: (1) when considering any acquisition of property, it is vital to consider what a reasonable layman would think he was buying; (2) every case turns on its own facts; and (3) the task of the court is to assess all available and admissible material in arriving at its answer, and then to achieve the correct answer. The land to which the squatter's application relates (the disputed land) must be adjacent to other land that belongs to the squatter (squatter's own land). There must not have been any determination of the exact boundary line between the disputed land and the squatter's own land under section 60 of the LRA 2002 and under any rules made under section 60. The disputed land must have been registered more than one year before the date of the application. If you want to challenge it you have to initiate proceedings in court. Your neighbour is likely to defend those proceedings, but the first thing the court has to do is determine where the actual boundary is, and secondly work out whether there is a valid AP claim to the extent to which the boundary structure sits on your side of the boundary. The fact that the fence is over the boundary line does not move the boundary. See my last post, Mac. Collaborate wrote: See my last post, Mac. Collaborate wrote: If you want to challenge it you have to initiate proceedings in court. Your neighbour is likely to defend those proceedings, but the first thing the court has to do is determine where the actual boundary is, and secondly work out whether there is a valid AP claim to the extent to which the boundary structure sits on your side of the boundary. When you say court do you mean court or 1st tier tribunal. I had a consultation on telephone with a civil litigation solicitor today and she advised that given the facts of my case she would take the matter to the 1st tier tribunal to determine that the land registry information is correct. She said the decision of the tribunal would be binding on both parties presuming the neighbour defended. Any comments on this process of 1st tier tribunal please? Is this the course of action your're suggesting? Ok so what is the defence to ensure "the neighbour cannot satisfy the registrar that it would be unconscionable to deny the squatter registration"? What would I have to do for the registrar to deny registration? "What does this mean please? "the squatter acted to its detriment in this belief that it owned the land:"
on this point "There must not have been any determination of the exact boundary line between the disputed land and the squatter's own land under section 60 of the LRA 2002 and under any rules made under section 60." I presume the answer to this is "No such determination exists"? If so is that in my favour or against? I really appreciate your constructive help as this is allowing e to understand better what realistic chance I have of defeating the AP claim when it inevitably comes. If its the case that I have little or no chance of defeating the AP claim - that's all I want to know really. Well it looks like the neighbour satisfies all 4 elements so I have no defence and its a waste of time taking action from what you've written. Do you concur? The only section I dont understand is how to ensure "neighbour cannot satisfy the registrar that it would be unconscionable to deny the squatter registration"
Not sure that they can be shown to have reasonably believed that they owned all of the land for the whole 10 years, given its challenge by both you and the previous owner. Your solicitor should be able to advise further. I'd also follow her advice re the 1st tier tribunal. She's the one you're paying. Collaborate wrote: Not sure that they can be shown to have reasonably believed that they owned all of the land for the whole 10 years, given its challenge by both you and the previous owner. where has it been stated that the predecessor challenged? the predecessor erected the fence!! My comments about the predecessor are based on anecdotal evidence. We have considered tracing him to see if he will confirm and be a witness. Thats a long shot so as it stands with what we have I cannot see how I can defeat the neighbour satisfying the four elements for AP. It was a consultation on the phone. It was quite detailed and she explained the route to a resolution of one sort or another. She did not explain how she would defeat the AP claim however and after reading your very detailed criteria I would not consider engaging her unless she explained how she would defeat AP claim. My predecessor inherits an unclear ambiguous boundary and tries to resolve it using title plan. Neighbour refuses to cooperate having enjoyed use of the additional land. It is up to the OP's solicitor to provide more detailed advice on the significance of this. Notwithstanding the above please look at a pic of the 1995 OS planning map. I have searched older OS maps and no physical boundary was shown. A boundary appears on this 1995 map so am I to presume something physically existed that was significant enough for OS to map it? FYI my property is 38. The boundary between 38 & 40 is in dispute. The disputed boundary finishes at a point on a building on the adjoining property. The building is an air raid shelter built circa 1940. 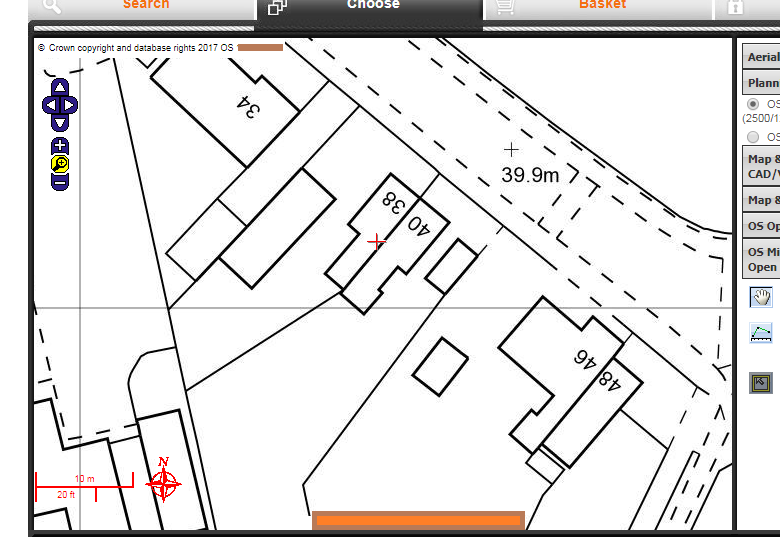 I have checked and accept the air raid shelter is plotted accurately in relation to other features around the properties.